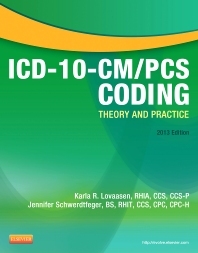 Completely updated and filled with user-friendly features, ICD-10-CM/PCS Coding: Theory and Practice, 2nd Edition provides a comprehensive introduction to ICD-10-CM and ICD-10-PCS medical coding all in one practical, hands-on resource! Leading medical coding authorities, Karla Lovaasen and Jennifer Schwerdtfeger, combine basic coding principles with clear examples and challenging exercises to give you a thorough understanding of diagnosis coding in the hospital and physician office. Dedicated ICD-10-CM/PCS coverage thoroughly prepares you for the proposed October 2014 ICD-10 implementation date. Integrated medical record coverage provides a context for coding and familiarizes you with documents you’ll encounter on the job. Disease coverage with illustrations and coding examples helps you understand how commonly encountered conditions relate to ICD-10-CM coding. Numerous coding exercises and examples in each chapter break key content into manageable segments and challenge you to apply chapter concepts to solve problems. A&P content in each coding chapter includes full-color illustrations to clarify important anatomy and physiology concepts that are essential for proper coding.